You are here: Home » Forget Basketball: The Beer Brackets are Done and Malt Madness is Here! 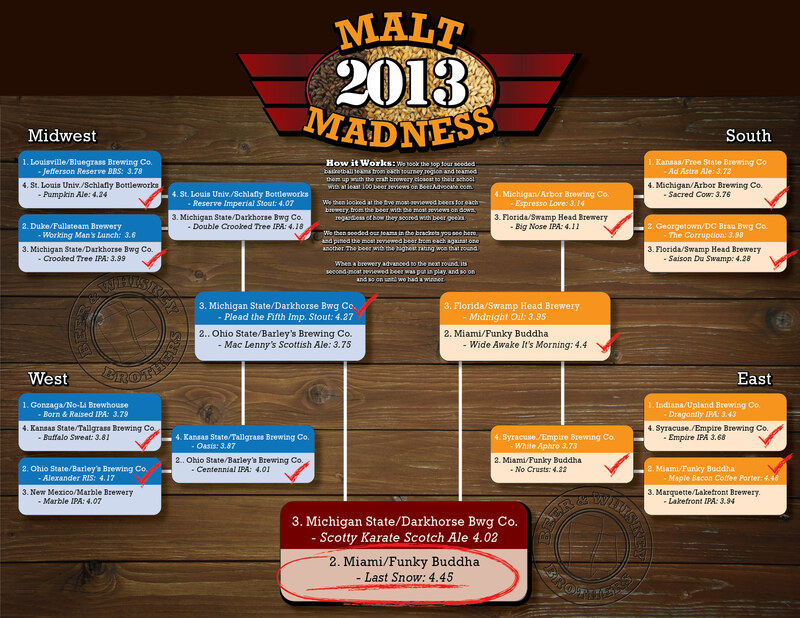 Forget Basketball: The Beer Brackets are Done and Malt Madness is Here! Prepare to be totally nerded out! We’ve taken the top 16 teams in this year’s March Madness college basketball tournament and paired them with local breweries in an attempt to find out which teams dominate when the beer is taking the shots. We turned to BeerAdvocate.com for the data, selecting breweries close to each school that had at least 100 beer reviews on the site. We then paired the teams off in the brackets you see below, and for Round One we had each brewery represented by their beer that had the most ratings on BeerAdvocate. The beer with the highest rating score (the number you see after the beer’s name on the chart) wins that round, and then the next most popular beer on that brewery’s list of reviews steps in for the next round. This continues again and again until we have a champion! Check out the results below, and if you really want to nerd out, check out this PDF of Malt Madness 2013 Data we compiled for the contest. I’m not sure what makes me happier – that the games start today, or that this thing is finally done! I just noticed that you went with Arbor Brewing for Michigan. Had you gone with Jolly Pumpkin, this might have played out very differently. Yes, but the main Jolly Pumpkin brewery is in Dexter, MI, not Ann Arbor. This is cool as hell. And I can get behind any bracket that has Kansas losing in the first round. Yeah, Free State is pretty mediocre. However, I’m surprised their barley wine didn’t rate higher. Best (most creative) bracket twist so far! Thanks, Mr. Monger. I thought it’d be fun to set up the mousetrap using BeerAdvocate’s data and see what happened! As a lover of craft beer and a alum of the University of Miami, this blog makes me happy! Or is that hoppy? Oh, and you have us beating Florida. Even better! I’d like nothing more if the Final Four came down to the same teams I have here, and Miami takes it all as a freak snow storm the “last snow” of the season blankets the Georgia Dome.